North High School student, Ozzie is one of 44 Partnership 4 Kids high-school seniors that graduated this past spring. 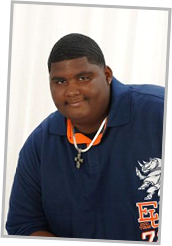 He is currently studying business administration at Metropolitan Community College. While at first blush, graduating and going on to college sounds like a pretty natural progression, for Ozzie and many of his 43 P4K classmates, the concept of obtaining a diploma and heading off to higher education didn’t always seem so realistic. “Ozzie has struggled almost his entire school career,” says a P4K program staff member. “School work is just something that hasn’t ever come easily for him,” she says. In sixth grade, Ozzie joined Partnership 4 Kids and met someone that completely changed the way he thought about school and education. “At first Partnership 4 Kids was just about hanging out with my friends and having fun,” says Ozzie, “but at some point I came to the realization that, ‘Wow! Maybe I really do need this program’,” he reveals. Ozzie’s grades were low and it was clear he was having trouble so P4K staff arranged for Ozzie to meet with a tutor. Twenty-something student-teacherJeff Kassal volunteered for the job. “It was my first year of student-teaching and Ozzie was one of my very first students,” recalls Jeff. Although Jeff was a teaching novice and Ozzie needed extensive academic help, the two began meeting regularly and quickly formed a strong bond. “When we first met, Ozzie was a pretty shy, but he was extremely polite and just really easy to like,” Jeff says. Despite his scholastic struggles, Ozzie earned his high school diploma and now has dreams of becoming a business mogul after he earns his degree. Ozzie credits Jeff for helping him to realize the importance of education. “School is power and it is what is going to get you where you want to go,” Ozzie says.